I’ve been DROOLING over the amazing wrap dresses that have been floating around in catalogs, high end stores, and the internet. These thing are FANTASTIC and gorgeous and amazing because of all the different ways you can wear them. 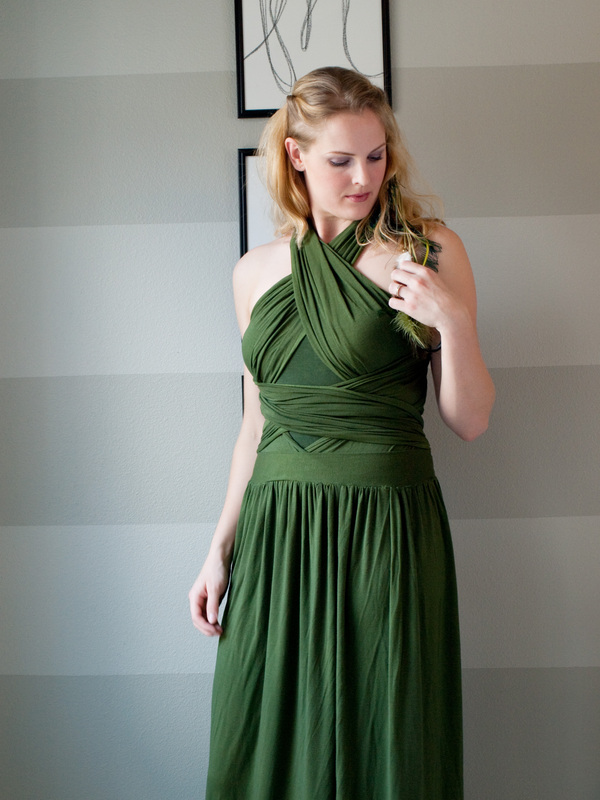 Seriously, if you have one of these dresses, you might never have to buy another dress again. You wouldn’t HAVE TO, but of course I will. Because I loves to SHOP! But anyway, these incredibly versatile dresses run anywhere from $70-$200 and might just be worth it because of how much wear you will get out of them. BUT, lucky for you you can save yourself some major benjamins and MAKE one! Yep. YOU CAN DO THIS. AND it’ll be awesome. 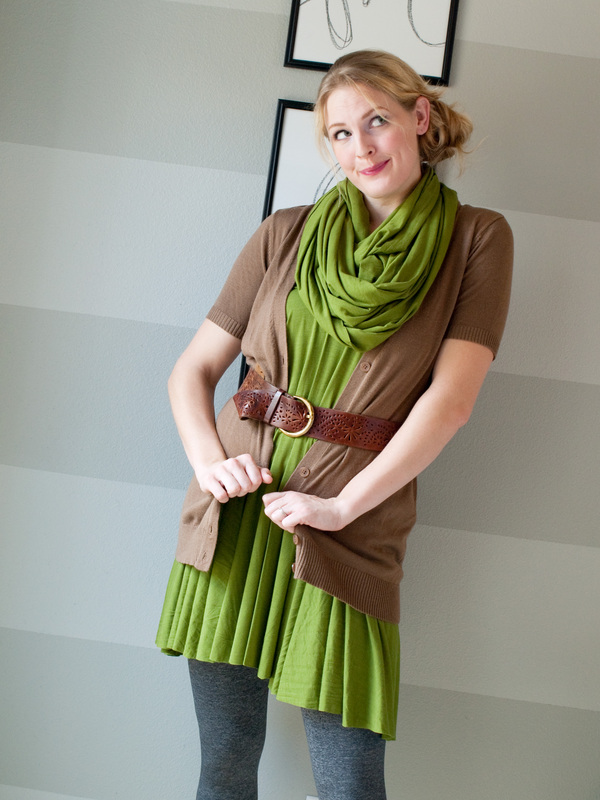 I found myself in JoAnns the other day loving all over some green stretchy knit fabric that was on sale for 30% off. 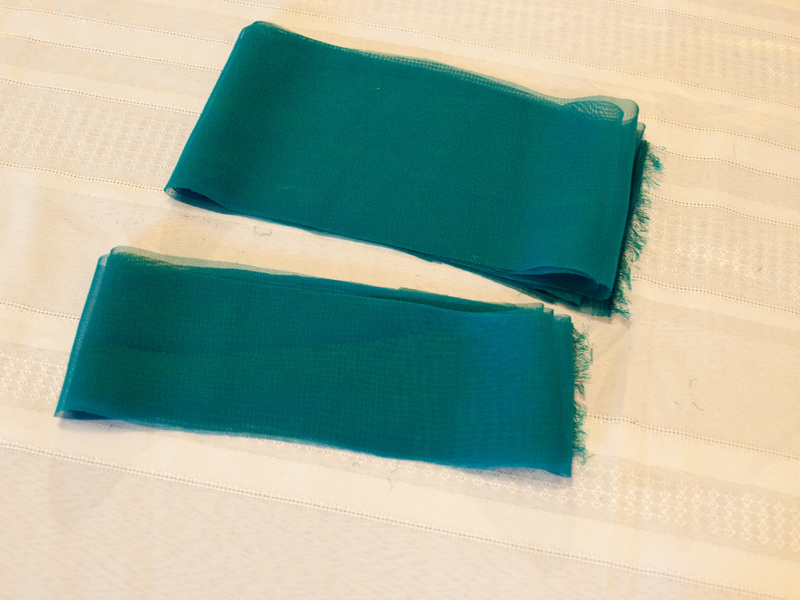 I LOVE all shades of green and blue and teal and so I bought 6 yards, without really knowing exactly what I’d do with it. I’m SO glad I did because I came home, did some googling, and found out that people are actually DIY-ing the wrap dresses I’ve been drooling over. 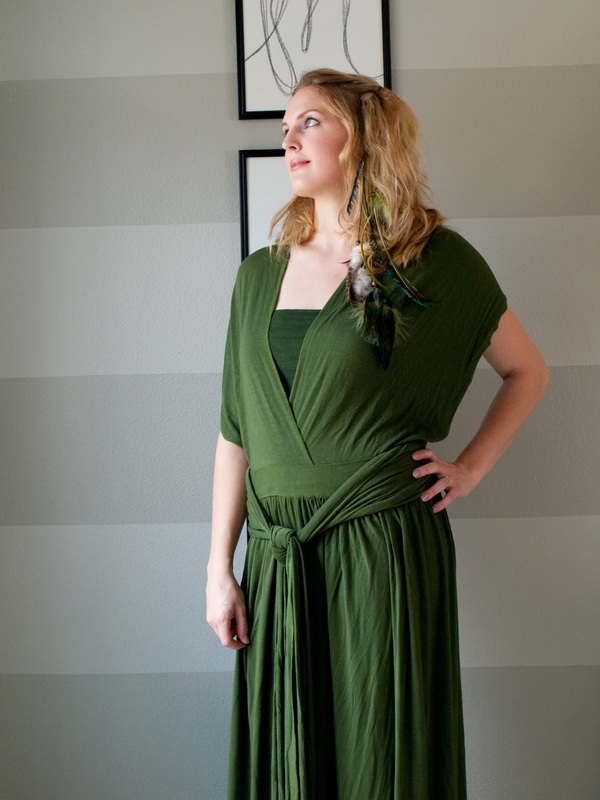 So, I made myself TWO infinity wrap dresses (or convertible wrap dress, transformer dress, etc.) out of my 6 yards and I LOVE them with a capital *SMOOCH*!! I made one short one (circle skirt style) that is fun and flirty and drapey and divine, and a long one (maxi skirt style) which I also dyed darker (using RIT dye in Navy Blue) and is regal, and elegant, and beachy. I used a combo of several tutorials I found online to make the dresses and a little of my own brain power thrown in. 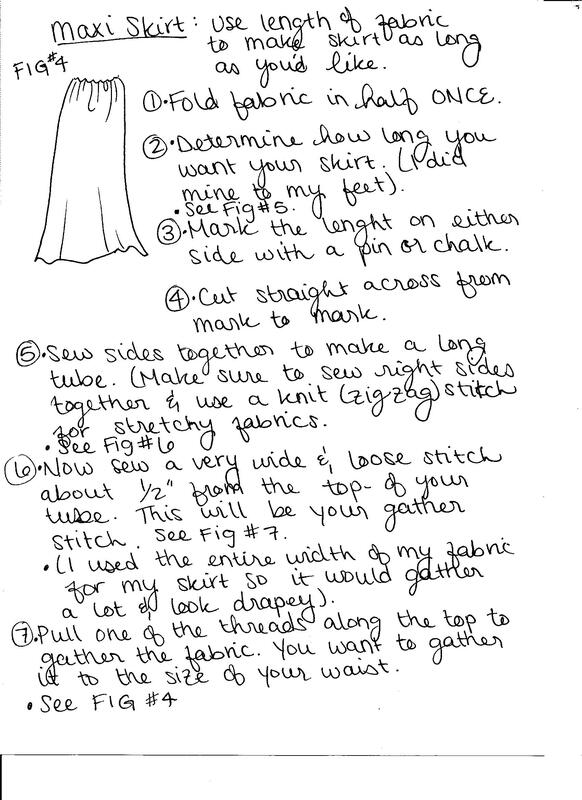 I didn’t find a really GREAT wrap dress tutorial though and so I thought I’d better document my process for any of you who’d like to DIY one or two for yourself. You’re going to have to excuse my messy handwriting and sketches, I wrote things down by hand as I went along instead of typing it up. But, I hope this is thorough enough for you and helps you get the job done a little easier than it was for me. Let me know of any tips or suggestions that you might have if you decide to make your own. Here is the blueprint. Feel free to print these off and use them but only for personal use please!!! Thats basically how I made mine (with a few adjustments that I learned along the way and threw in to make it easier for you guys). Would you like to see how to wear it?! I had a little fashion show this afternoon and tried out some ways, but you can also find tons of youtube videos on how to tie a convertible wrap dress if you would like to learn more. 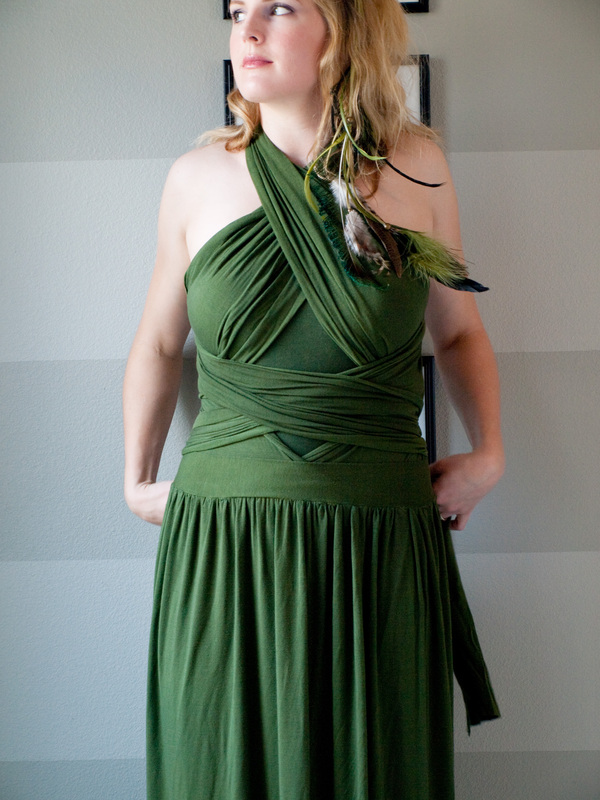 Strapless style…and totally cute with the teal if you ask me. There you go my friends! If I can do it, you can do it. Seriously, I made both dresses this Sunday afternoon. Use a knit stitch or zigzag stitch for stretchy fabric. 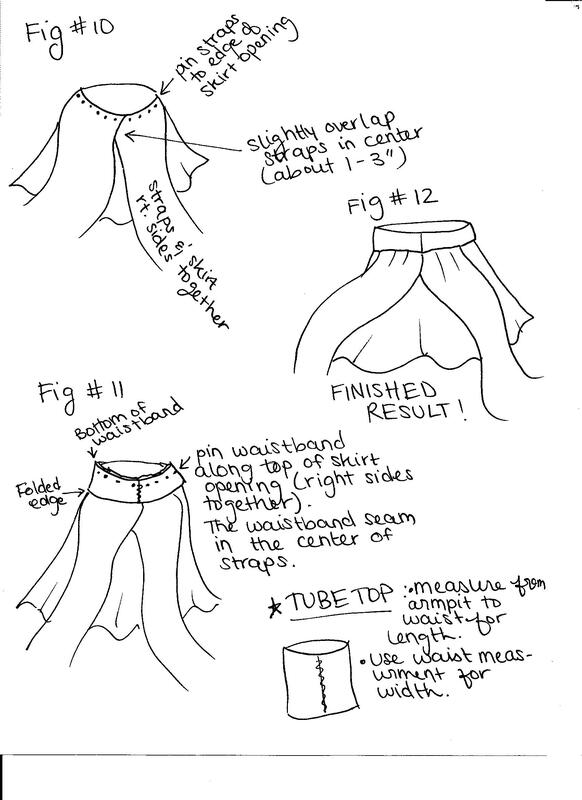 Realize that this fabric is STRETCHY so make your skirt and waistband somewhat smaller than you think you’ll need to. Especially the waistband. 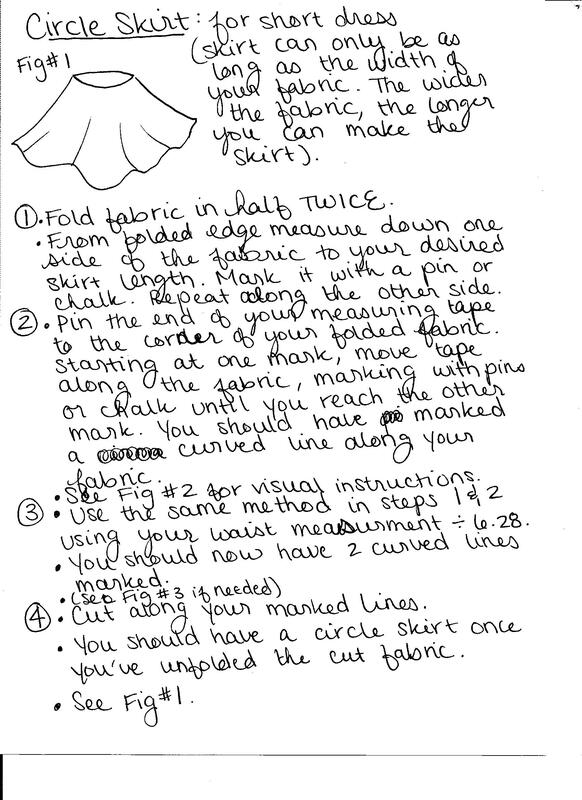 The weight of the skirt will want to pull it off your waist if it is not tight enough. For Christmas I made a necklace for my big sis inspired by a sweet little something I saw on ModCloth. It was a super easy project and I was really happy with the way it turned out so I decided to make myself one as well. 🙂 Merry Christmas me. My DIY’d knockoff turned out just as well I think. The great thing about this project is that you don’t need jewelry making tools (or skills really). 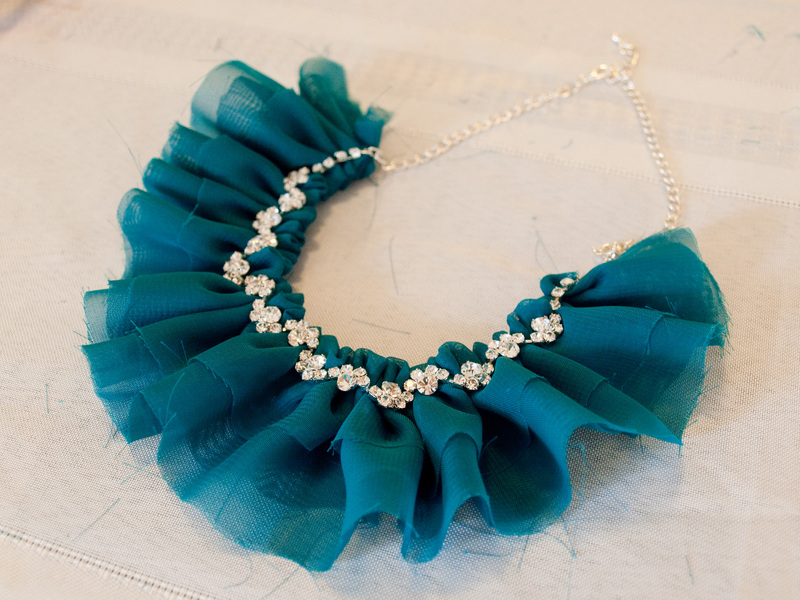 All you need to do is basically sew a chiffon ruffle onto the back of some glitzy costume jewelry. And voila! But just in case you’re still feeling anxious about it, I’ll walk you through the process with a little tutorial. 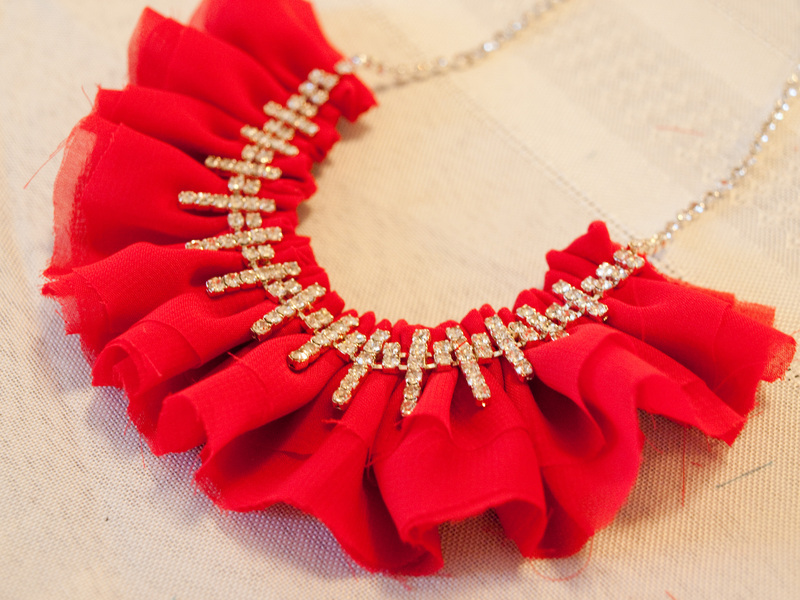 A glitzy rhinestone necklace. I found mine for $5 at Walmart on clearance. 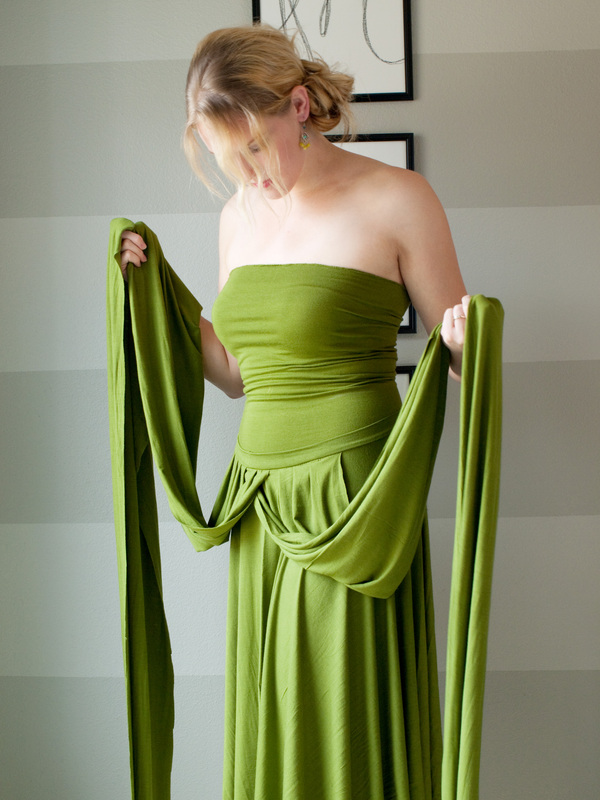 A scant amount of chiffon in the color of your choice. You can buy chiffon by the yard or ask around for scraps as this doesn’t take much. Thread in a matching color. 1. First thing to do is lay out your chiffon. You’re going to want about 2 or so strips stacked on top of each other. 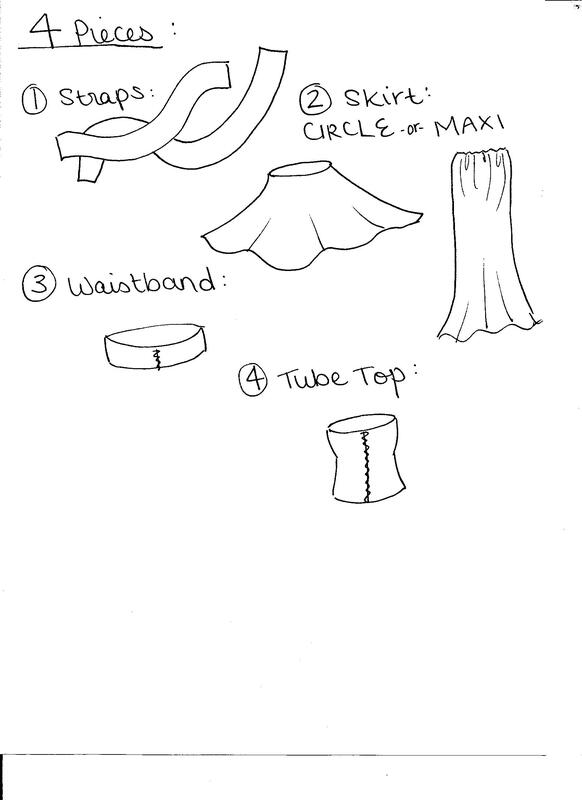 The easiest way to do this is to fold your chiffon a few times and cut into 3″ or so wide strips. Then, just unfold them and lay them out. 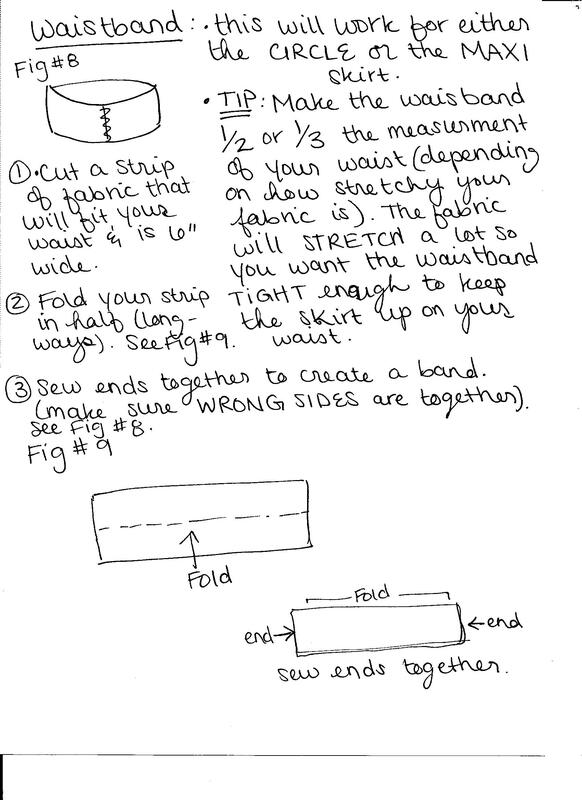 *TIP* Make your strips about twice as long as the “fancy” part of your necklace. 2. Now, stack the strips on top of each other and fold them in half long ways (hot dog way). It is best at this point to pin them together so that they will stay put while you sew. 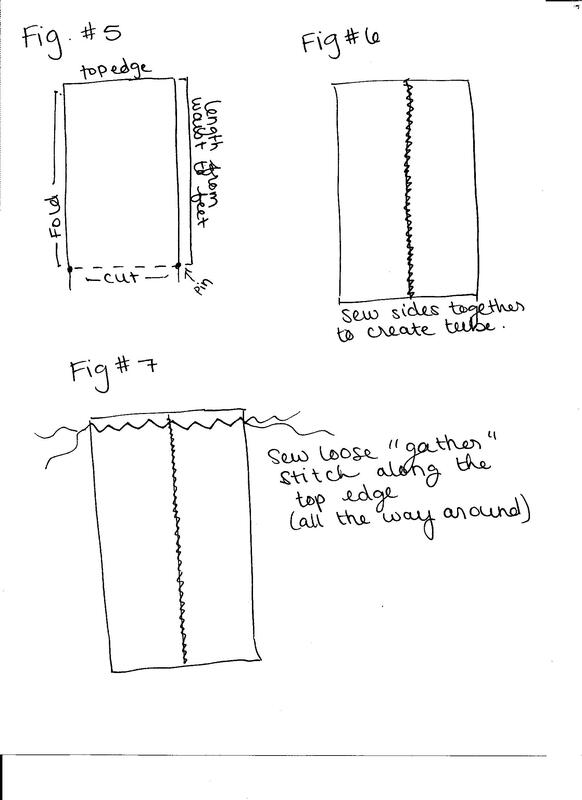 Now, sewing by hand, sew a straight, wide, stitch trough the top of your folded stack (about 1/4″ inch below the fold). 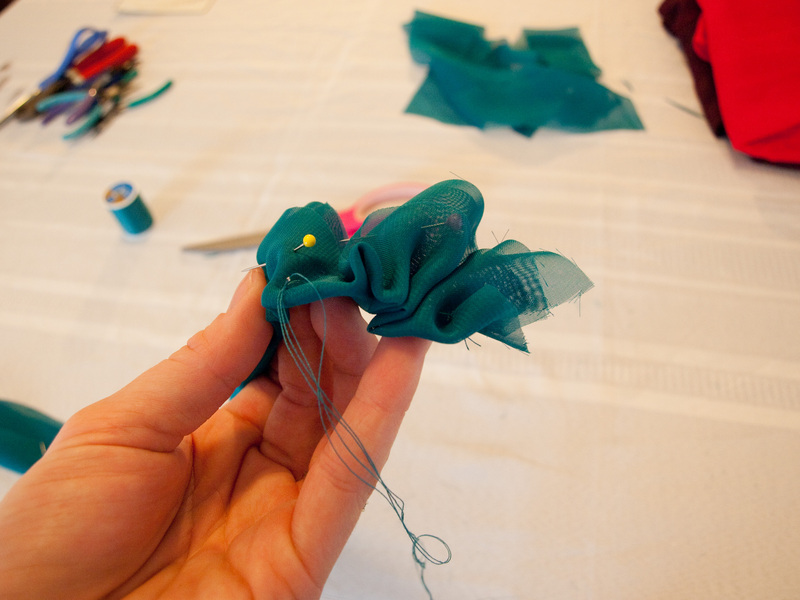 Start pulling the chiffon down the thread to gather and make a chiffon ruffle. 3. Once you have made your ruffle. This is about what you should have. 4. 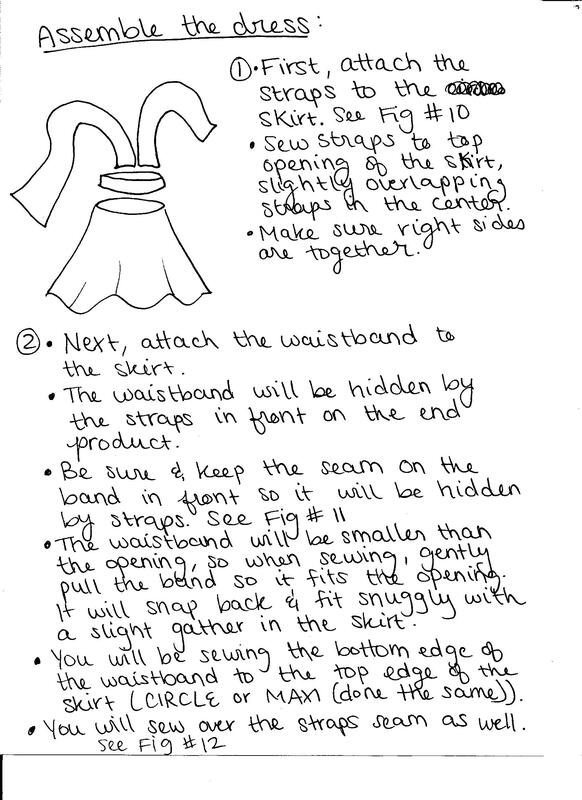 The only thing left to do is to sew your necklace to the front of your chiffon. 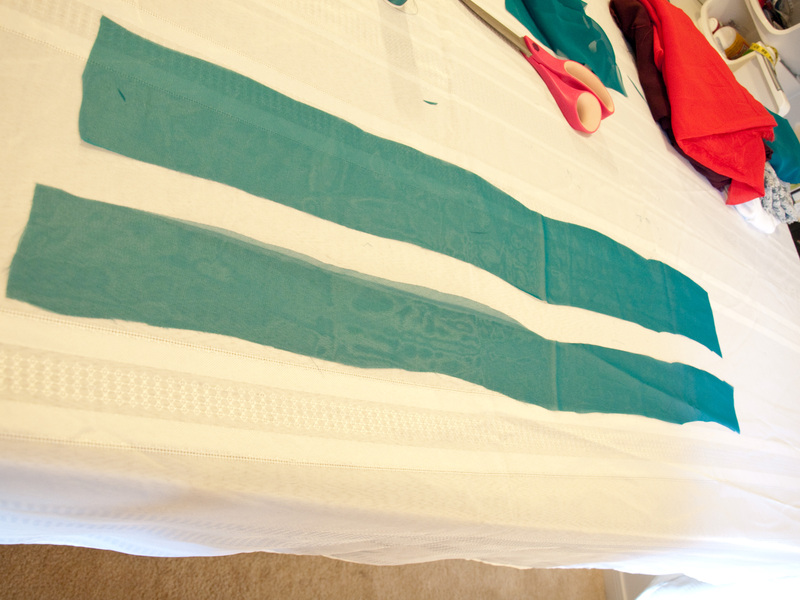 *TIP* Don’t worry about the strips being cut perfectly straight. 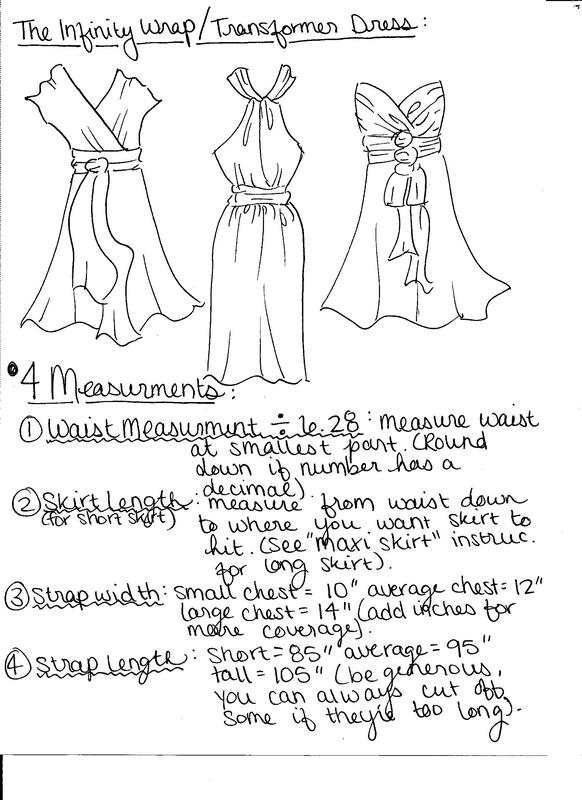 As you can see from the image above, the varying lengths give it a loverly layered look like in the ModCloth version. 5. Find the end of your “fancy” part on your necklace. 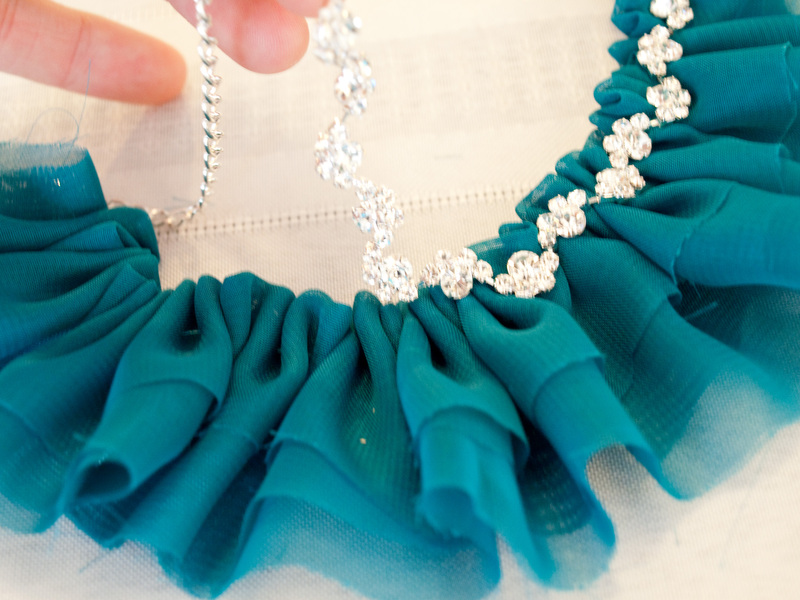 Hold it in place on top of your chiffon (about 1/4″ from the fold) and sew from back to front, securing the necklace in place on top of your ruffle. 6. 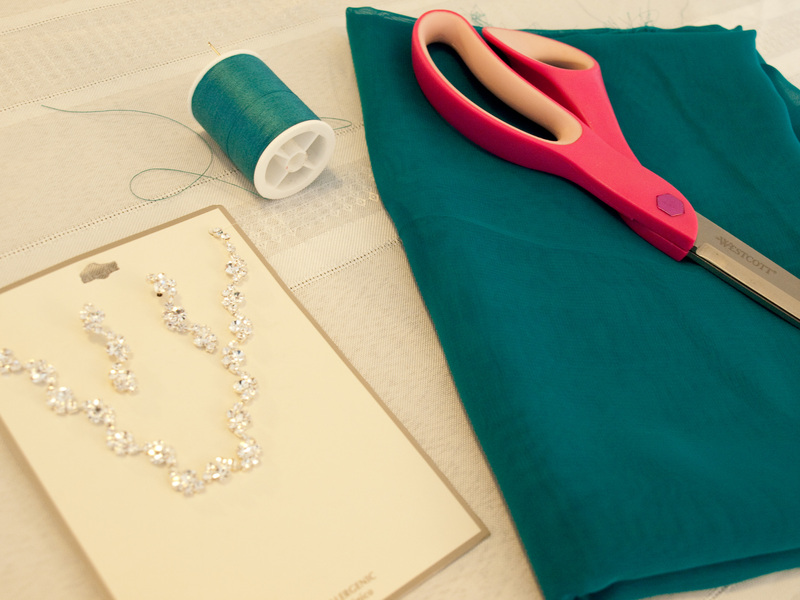 Keep sewing on your necklace until you get to the other end of your “fancy” part. (And yes, that is the technical jewelers term). 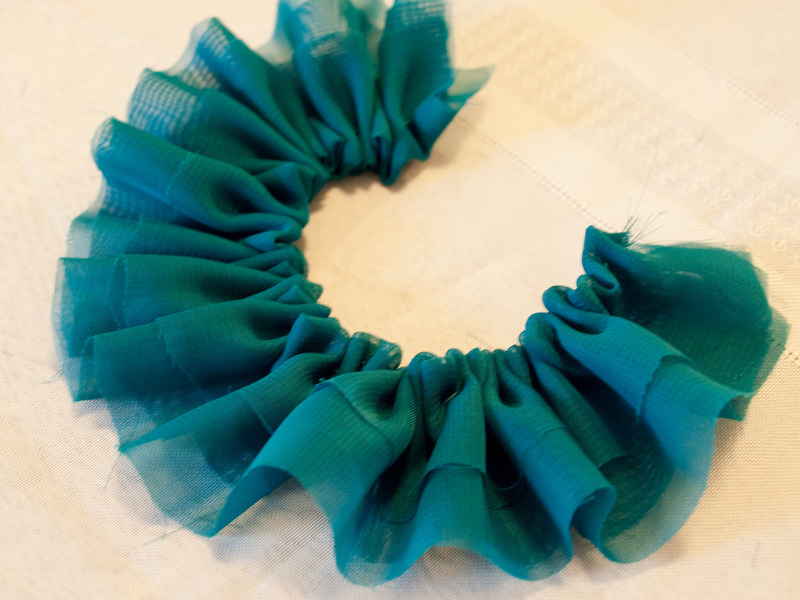 If you have leftover ruffle at the end, just snip it off. 7. If you’d like you can apply fray check to the edges of the chiffon but I prefer to leave them raw and let them fray a little for that shabby chic effect. There you go! 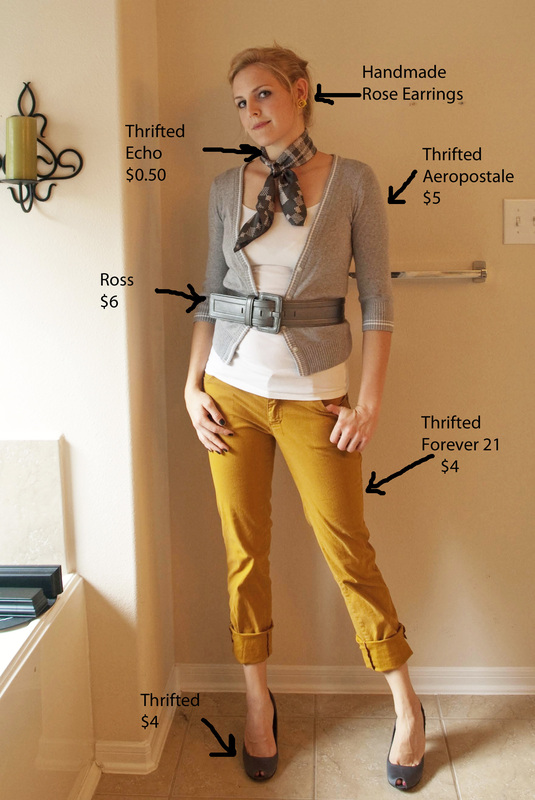 A great little ModCloth knockoff for half the price! Are you guys ready for some lovin’? 😉 If not, check out some of these last minute Valentine’s Day cards, signs, printables, and crafts. So FUN aren’t they?! These adorable Love Bug Valentine’s would be great for the little ones. Find the bugs at the Dollar Store and get the jar printable at Dandee. Martha Stewart knows how to really rock the card making! I love these and they’d be especially easy with a dye cut machine. 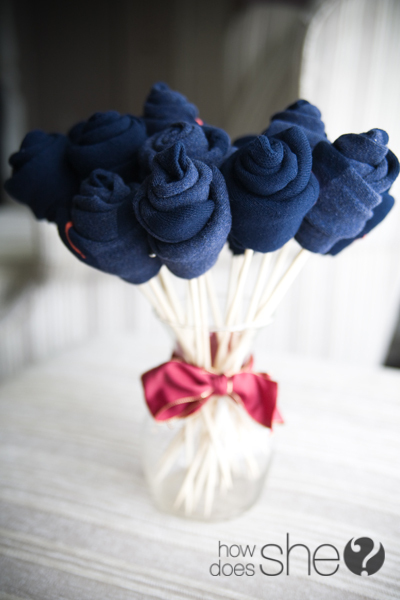 This is a fabulous idea for a man bouquet! 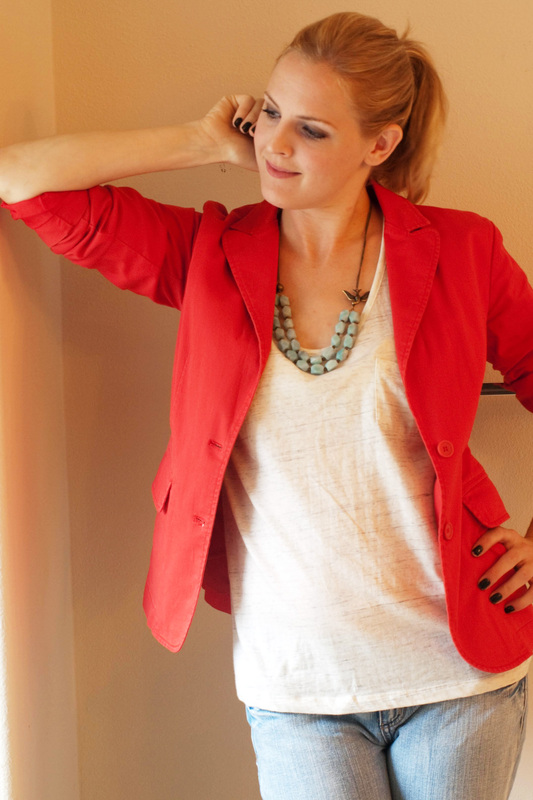 Heather over at How Does She? made an ingenious bouquet out of mens socks for her guy this V’day. So great. You could probably also do the same kind of thing with underwear or t-shirts or ties. 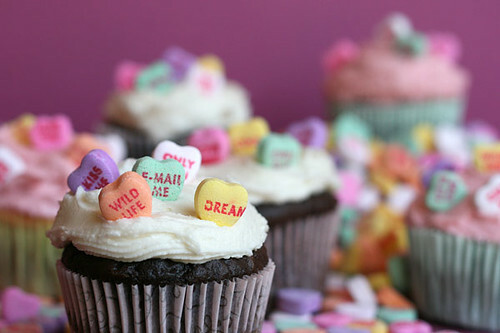 Bakerella made these darling and simple cupcakes for V’day. So sweet and easy even I might be able to pull off whipping these up! 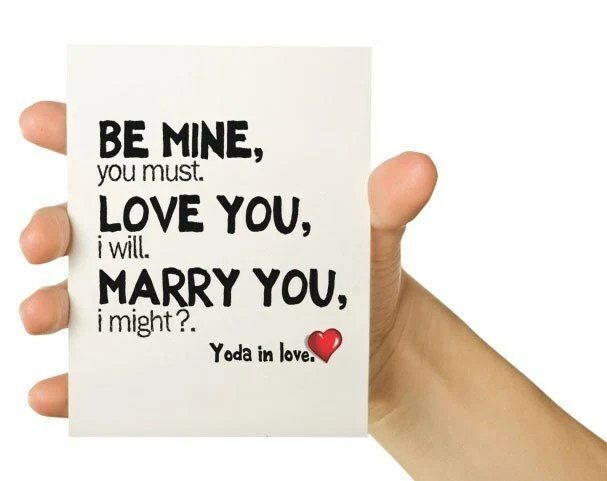 Want a funny card/geeky/sci-fi card? Check this out from the Wallaroo on etsy. LOVE it. Or this adorable card from Rifle Paper Co.
Make a sweet clay heart pendant with Mitsy of ArtMind. Speaking of clay, you could always go back to my clay rose tutorial and make some adorable vintage inspired rose rinds, earrings, or even refrigerator magnets for the special ladies in your life. I saw this on Pinterest (follow me on pinterest if you’d like) and thought it would be another great freezer paper (or applique) project! Spice it up a little bit tomorrow night! 😉 Or, if you’re NOT in the mood, create the other side to say “In Your Dreams”. I hope you all have a FANTABULOUS VALENTINE’S DAY!!! See you back here in a few! Howdy there!! Welcome to 2012 (a month late)!! After a long time away from my dear blog I’m back and ready to bring this thing back to life. I’ve had a difficult time balancing the normal stresses and time constraints of motherhood, family duties, volunteer work, work work, and my extra activities but I’m determined to find some more time to post here because it makes me happy and keeps me sane. So thats that. For my sister’s 30th b’day I wanted to do something a little extra special. I racked my brain for a while and visited Etsy and Pinterest in hopes of finding inspiration. I make my sister stuff all the time, and didn’t want to bombard her with yet again another handmade doo-dad, but her hubby said that my handmade stuff is what she likes most. She already has paintings of mine hanging in her house, she has plenty of jewelry from me, what else could I do. Think. Think. Think. Browse. Browse. Browse. Ding! Lightbulb moment. I came across this amazing website called Simon’s Stamps. My sister likes making handmade cards and such (she is super crafty and makes all kinds of adorable things) so it hit me that I could design her some custom stamps and get her some funky colored ink pads. YES. DONE. Thank you Simon, I think I will. Well, would you like to know how I made my designs? You’ll be surprised by how easy it was and once you know the tricks, you’ll be addicted and will want to make one for every face you know! 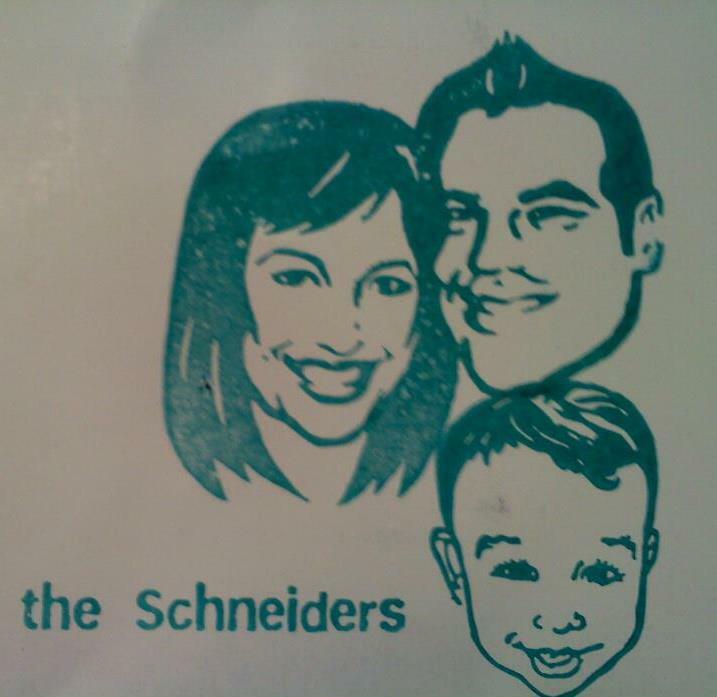 A good photo of the person’s face who you are making the stamp for. 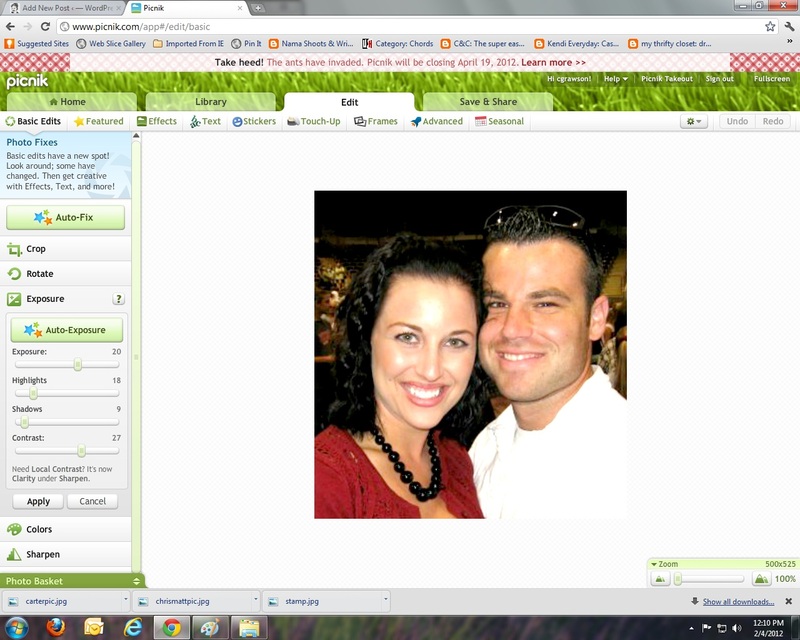 Access to the internet (to use Picnik) or access to other simple photo editing software. A scanner (if you don’t own a scanner, you can do a bit more work on the photo editing and omit the “artsy” part of this project. Or you can download a scanner ap on your phone and use that). 1. 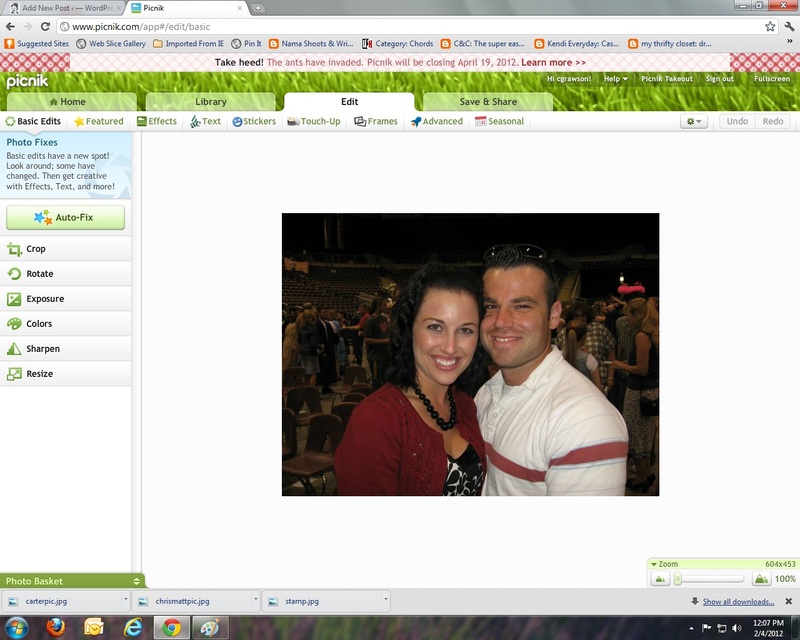 First thing to do is find your photo(s). I perused my sis’s facebook page to find the photos I used to create her stamps. The one below is the pic I used to create the stamp of their son Carter. 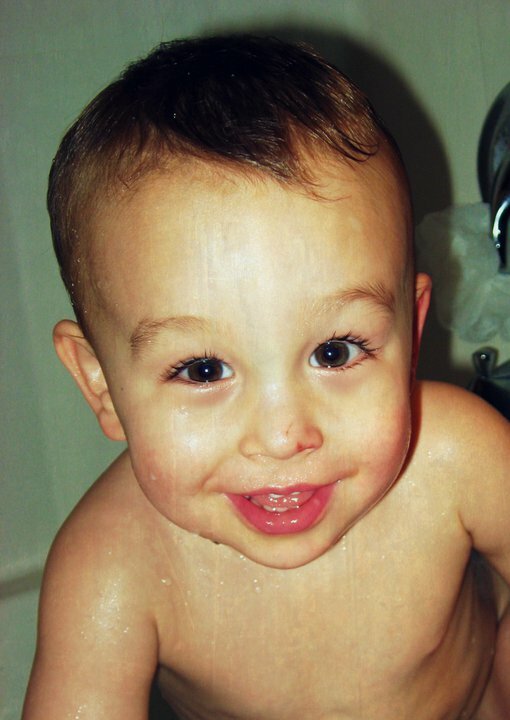 He seriously looks like the “Gerber baby” in this pic. So cute! 2. Now just simply save your photo to your computer and upload it to your photo editing program. As you know I use Picnik, its cheap, easy, and I love all the features. Open your photo up in your editing program. If you need to, crop around the faces to get rid of the excess photo space. 3. Play with the exposure and contrast a bit until you begin to see more defined lines. 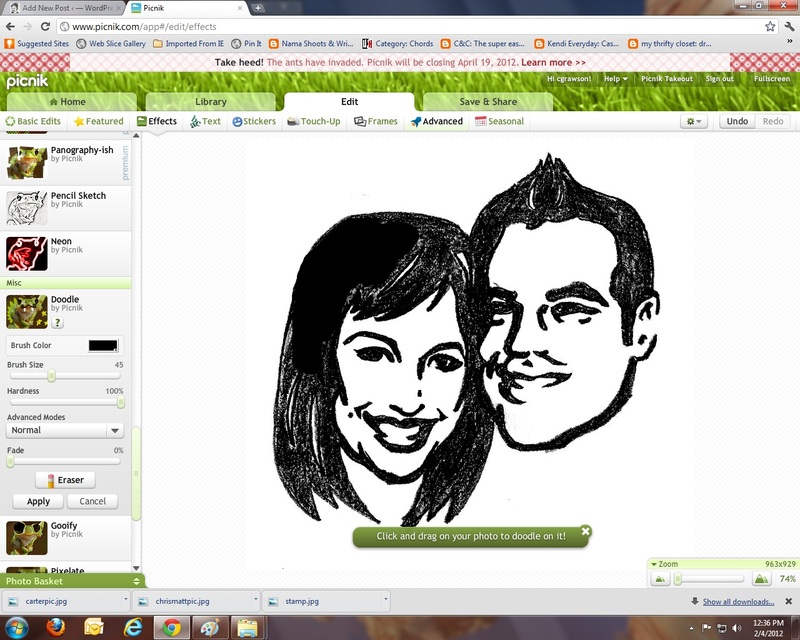 What we’re trying to do is create somewhat of a posterized line drawn image. 4. Now just use your “Effects” tools (if you’re using Picnik) to get as close to a posterized look as you can without losing too much detail. Be conscious of the fact that you want the end product to really look like the person, so try to keep distinct characteristics present while editing. I turned my pic to black and white, boosted the contrast (using “Boost”), and slightly posterized it by using “HDR-ish” and “Posterize”. 5. Once you have a pretty good template made up that you think you can work with, save it and print it off. 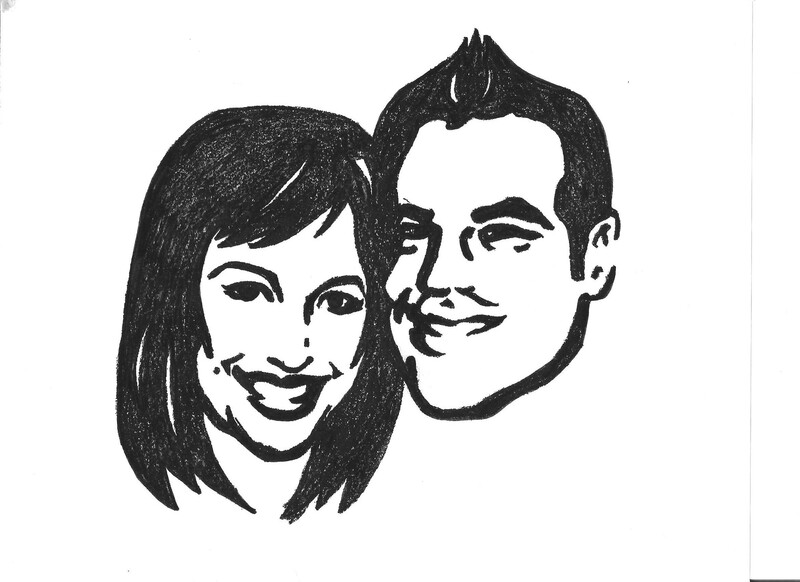 *TIP* The larger you print the pic, the easier you will be able to “tweak” it with your black marker by hand. 6. Now is where you summon up the courage to get a little artsy. Take your printed image and another clean sheet of computer paper to the nearest window (or light box if you happen to own one). Use a piece of tape to tape the image to the window and tape the clean piece of paper over it. 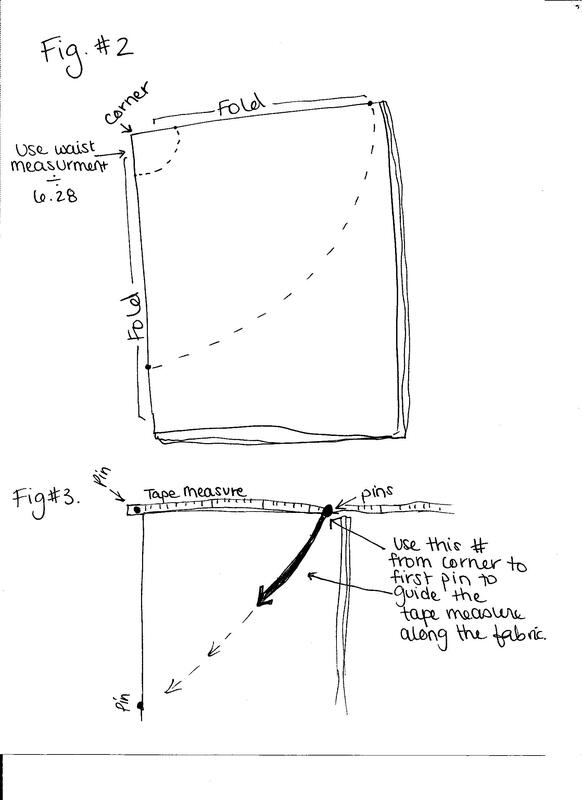 Above is what my design looked like after I had done step 7 and scanned it into the computer. 8. Scan your new black and white design to upload it back on to your computer. Be sure to choose “black and white” in your scan options (it will save a step later). 9. Unless I wanted all those little white spots to be in my final stamp, I needed to “color them in”. I did this by using Picnik’s “Doodle” tool which is basically a paintbrush to go over all my dark areas that needed it until I saw negative (white) space in all the right places. I also used the “Posterize” tool at the end again to just round out any rough edges. 10. 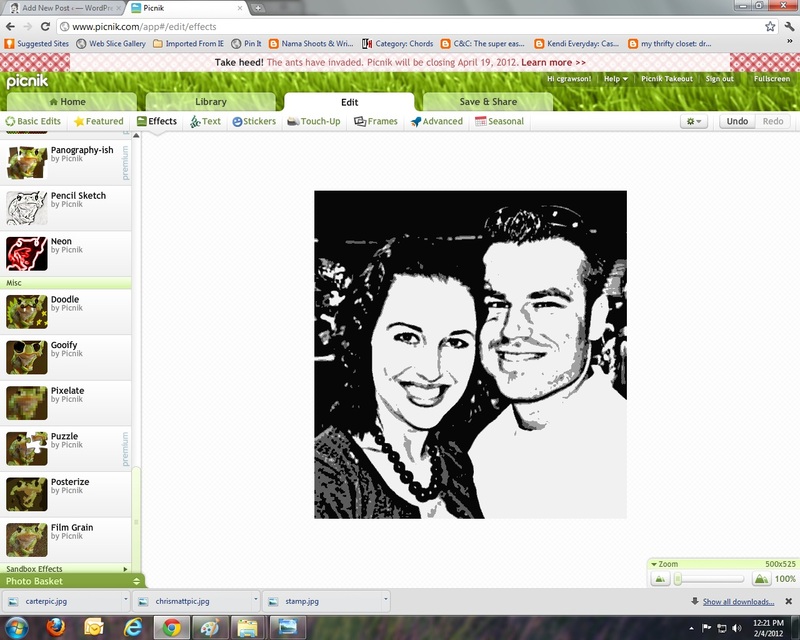 Now simply save your new design to your computer and then follow the instructions on Simon’s Stamps page (go to “Custom Made Art Mount Stamps” in their sidebar, and decide how large you’d like your stamp to be). 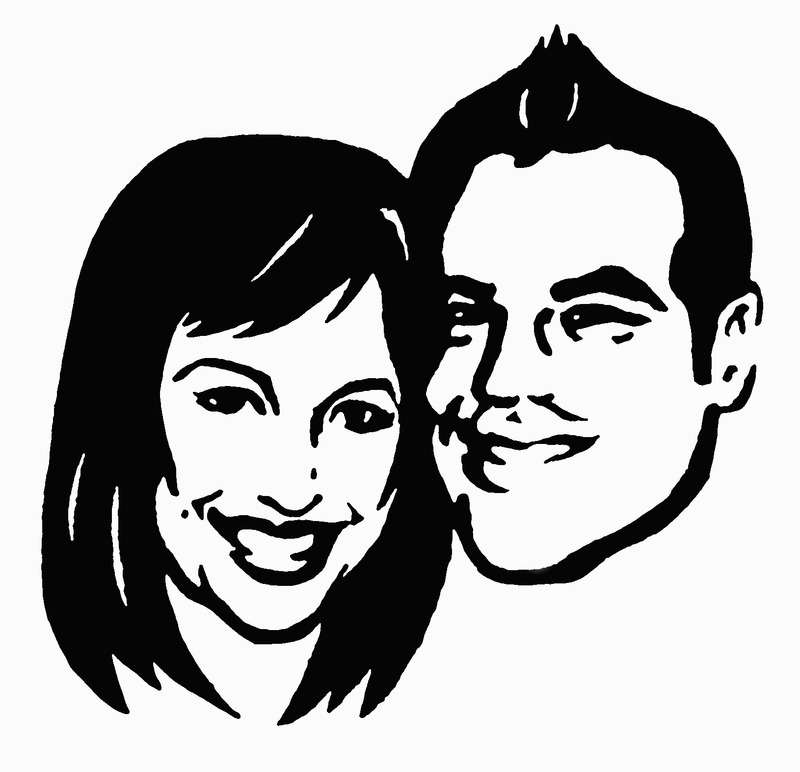 Upload your design, order it, and wait for your friends and family to be amazed, thrilled, flattered, and impressed when you give them their very own custom portrait stamp! So CUTE right? Anyway, Christen LOVED her new stamps and I LOVED making them. I hope you do too! P.S. These would make fabulous wedding or engagement gifts! Also, you could use this same technique to create custom artwork (Warhol style?) and other fun stamps of all kinds of things, people, creatures, etc. Go. Stamp it up my friends. 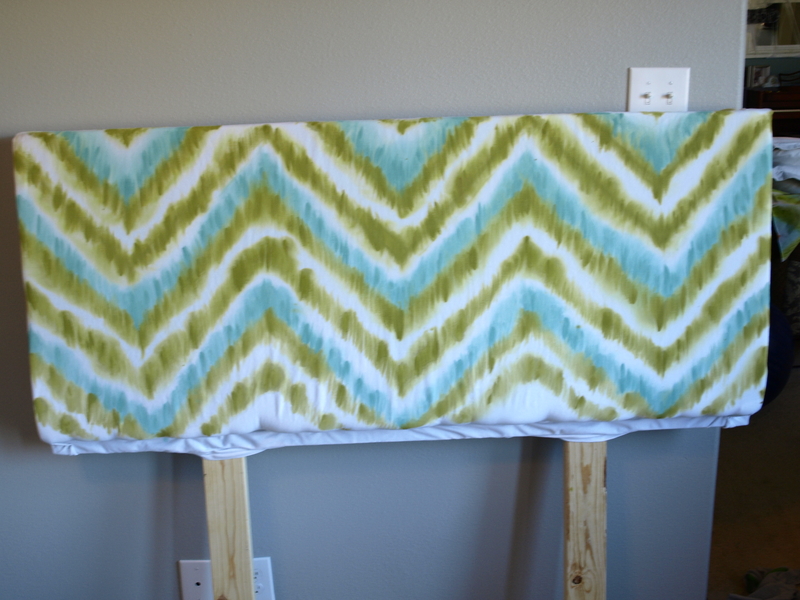 DIY Handpainted Chevron-Ikat Upholstered Headboard…tutorial. 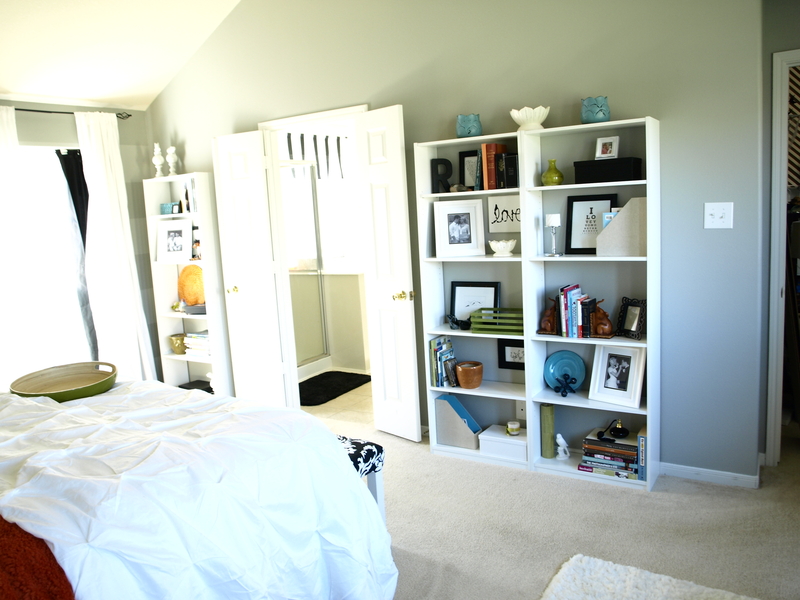 Well I have been getting a lot of feedback on my newly redesigned master bedroom (thank you for all the nice comments!) 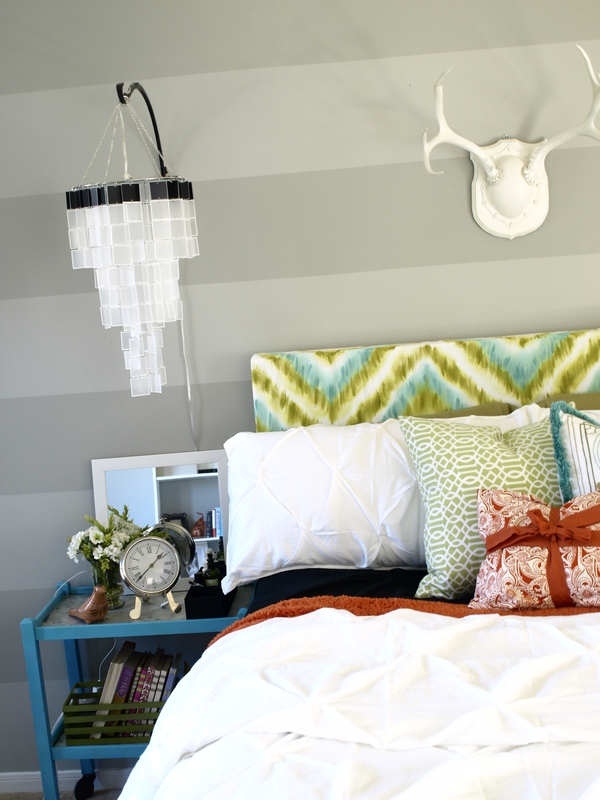 and so I thought I’d better get the headboard tutorial up for those of you who are interested in DIY-ing one yourself. 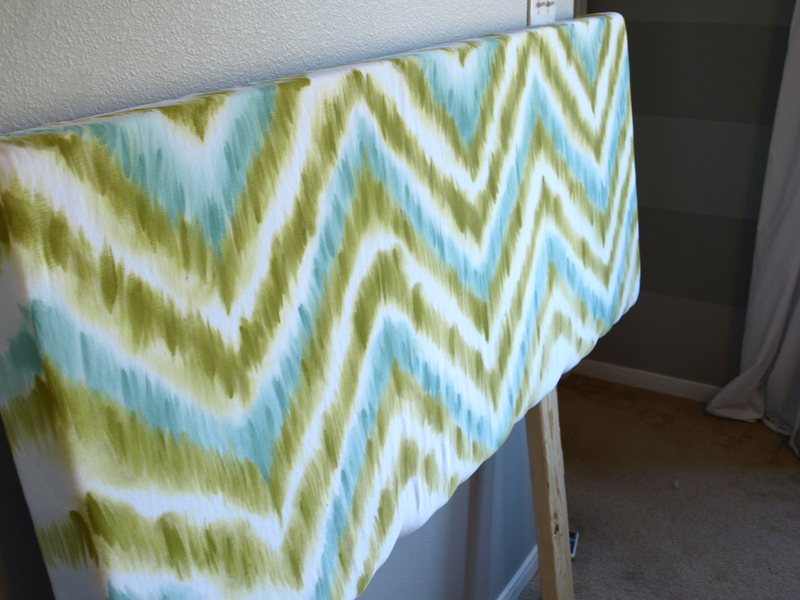 This isn’t so much a tutorial on how to build an upholstered headboard (there are plenty of tutorials out there on that) but more how I handpainted the chevron-ikat pattern onto my plain white headboard fabric. Since I’d never done anything like this before, I pretty much guessed my way through it so my headboard is far from perfect. To be honest, I’m thinking about completely repainting it with my leftover fabric. But, lucky for you, I can walk you through what I did right AND WRONG and you can learn from my mistakes and make yourself something beautiful. 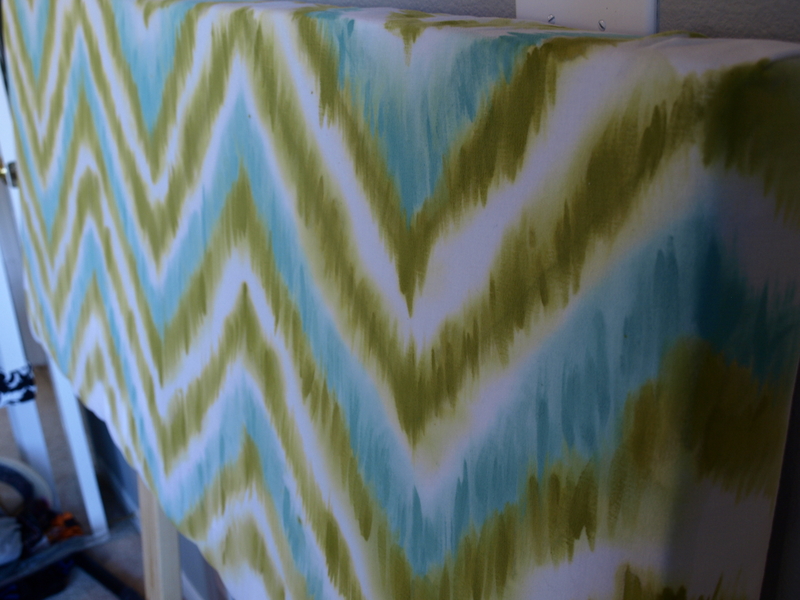 The best part is you can use this fabric painting technique to paint anything, headboards, pillows, chairs, t-shirts, whatever. White or other light colored fabric. I used 2 yards of white cotton twill (from Walmart for $5/yd) for my headboard. 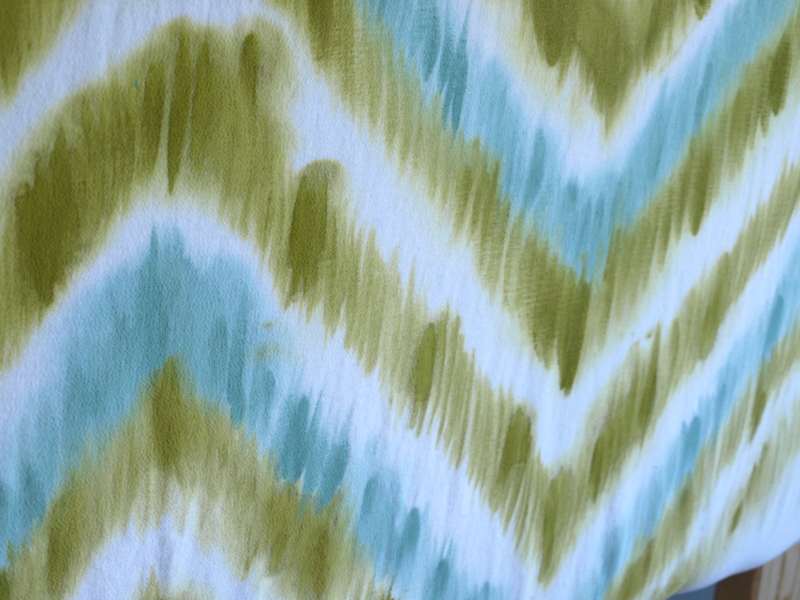 Natural fabrics work best and allow the paint to bleed a little bit. 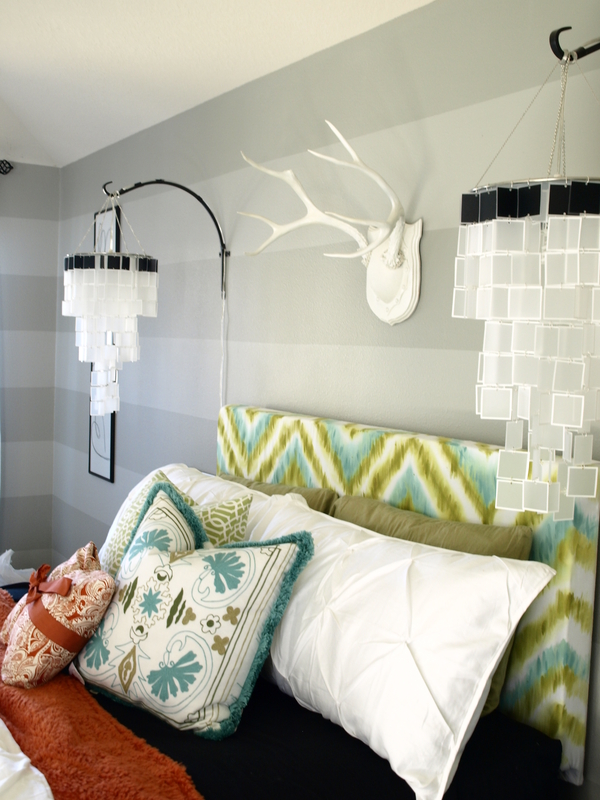 Craft paint in your color choices. I used a limey green and a tealy blue. 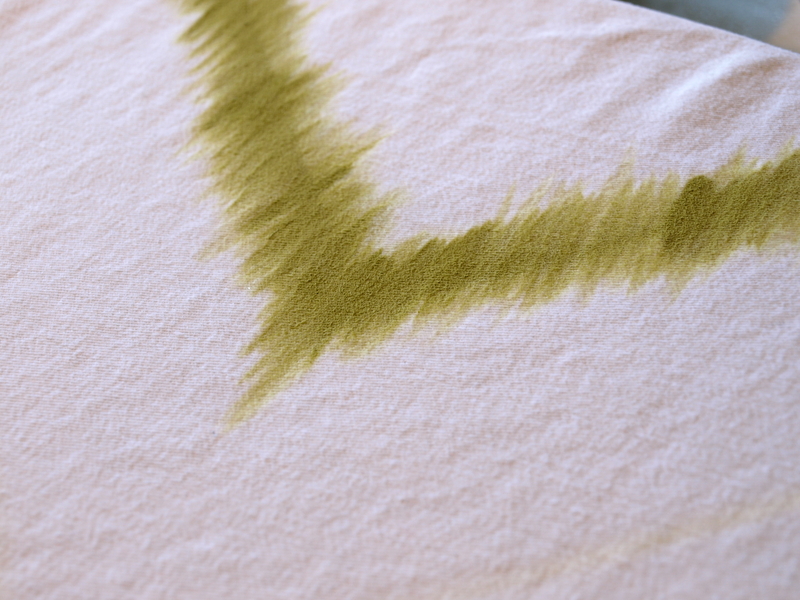 Textile Medium. 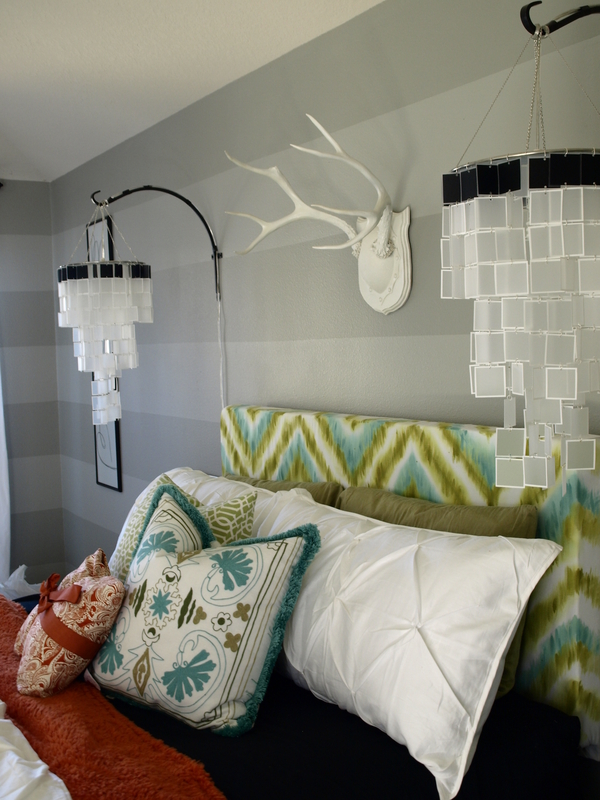 To mix with the craft paint to make it soft like fabric paint. (Or you could just save yourself this step and buy fabric paint instead). A medium sized flat/square tipped craft paint brush. A spray bottle with water in it. A water bowl to rinse brushes. 1. 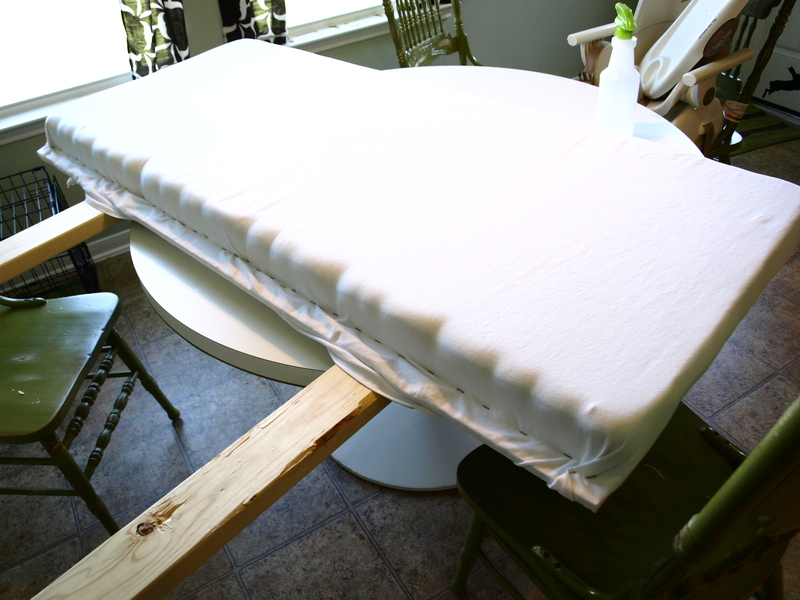 I first upholstered my headboard in the white fabric by staple-gunning the fabric around to the back of the padded headboard. Then I layed my headboard flat on the table to start painting. 2. Next I got a square tray I had (you could also use a right angle ruler if you have one) and trace the corners of it onto my headboard lightly with chalk. DON’T use chalk to do this. It sucked up my paint wherever it was and made some really distinct paint lines that I don’t love on the finished project. You could try a pencil or just dots of the paint color you’ll be using to give you the guide you need. I’ll be honest though. I did this only for the top portion of my headboard and then got lazy and didn’t do it to the rest. I wish I would’ve though because some of my lines got whompy because I was winging it without a guide. Thats what I get for being an impatient crafter. 3. 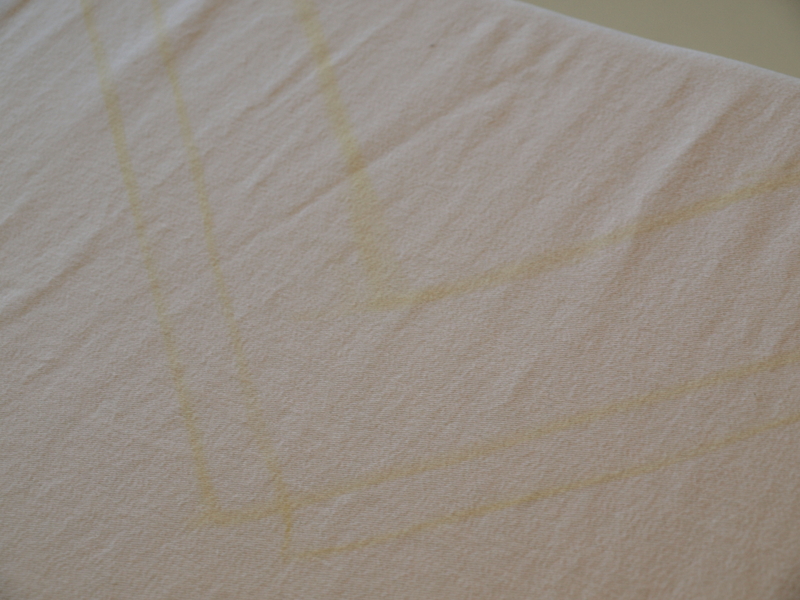 Next, working in small sections, spray the fabric lightly with water. I would recommend testing the amount of water you need to be spraying with the amount of bleeding you want to get on a scrap piece of fabric before you try this on the real thing. I didn’t do this and learned as I went. I got the right hand side of my headboard pretty soaked and then learned that “less is more” and so the left side has less bleeding (which I like better). You probably only need to spray a section two maybe three times and no more. 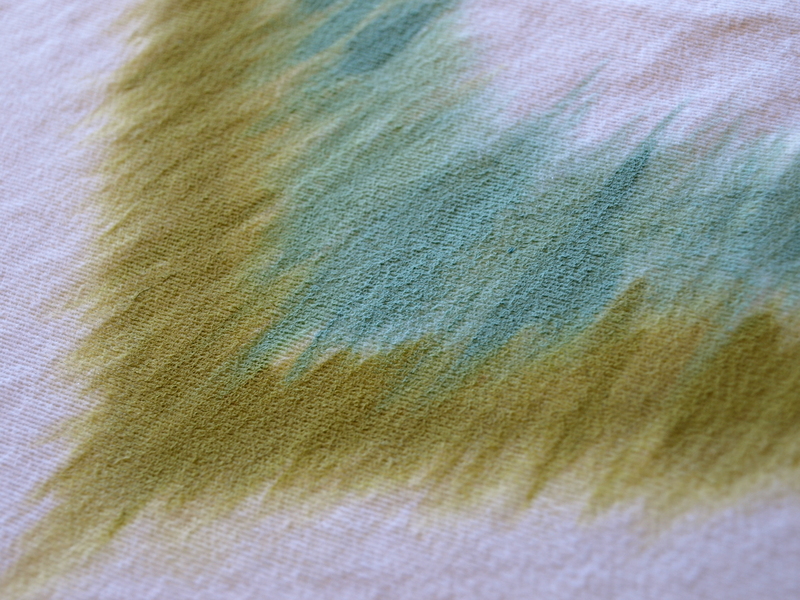 You don’t want the lines to become tie-dyed looking, but you do want the colors to bleed slightly into eachother. 4. Now, holding your brush so that the square tip is on its side (or that the tip of the paintbrush looks like a vertical line), dip your brush into the water and then into the first paint color (after mixing it with the textile medium per the instructions on the bottle). 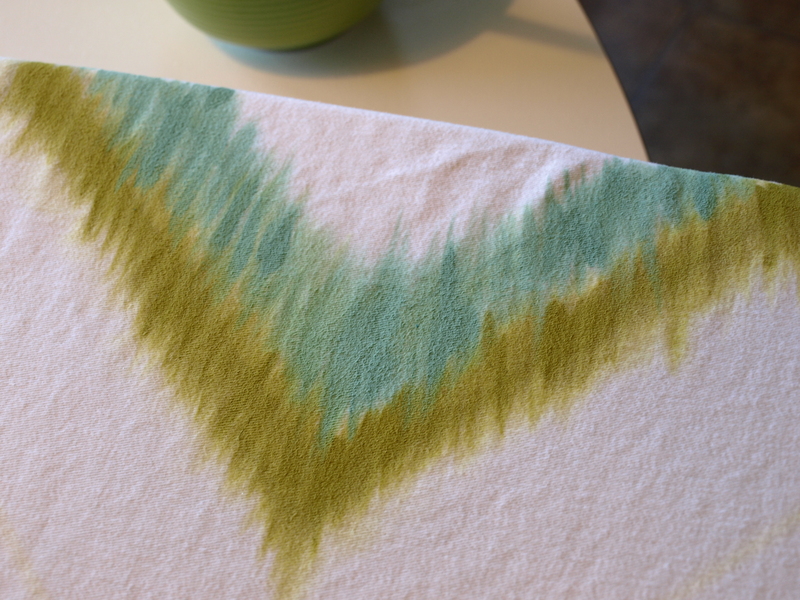 Then follow your guide using up and down choppy strokes on your fabric. 5. When you have a section done, switch colors and do the same thing with the next color except push that color into the first color a little bit. You may have to give it a squirt with the water bottle if the fabric has dried. And thats what I did! I would like it much better I think if I did it again and really took my time. But, hey, not too shabby for a first try I guess. The kids were down for naps and I had just hung up and put away all the laundry which meant everything I own was accessible. I started looking around my closet with that really proud feeling that you get when you have NO DIRTY LAUNDRY. You need to relish it because of course it won’t last long. Anyway, I suddenly got the urge to try on outfits and see what I could come up with out of my wardrobe. So, I thought I’d take pics so I can remember the ones I like. So heres my little fashion show! 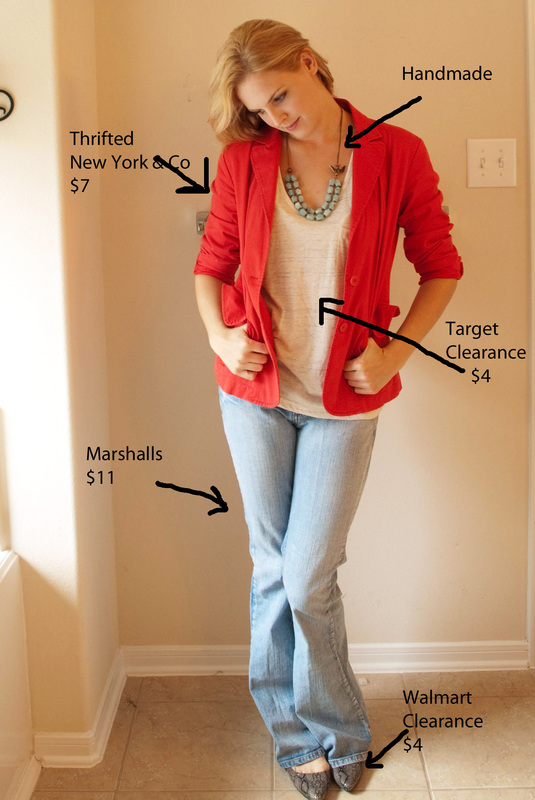 🙂 If you’d like to know my TOP 10 THRIFTING TIPS go here. So what do you think of my dyed skirt, spray painted shoes, and thrifted threads? 🙂 I love my happy little closet. P.S. 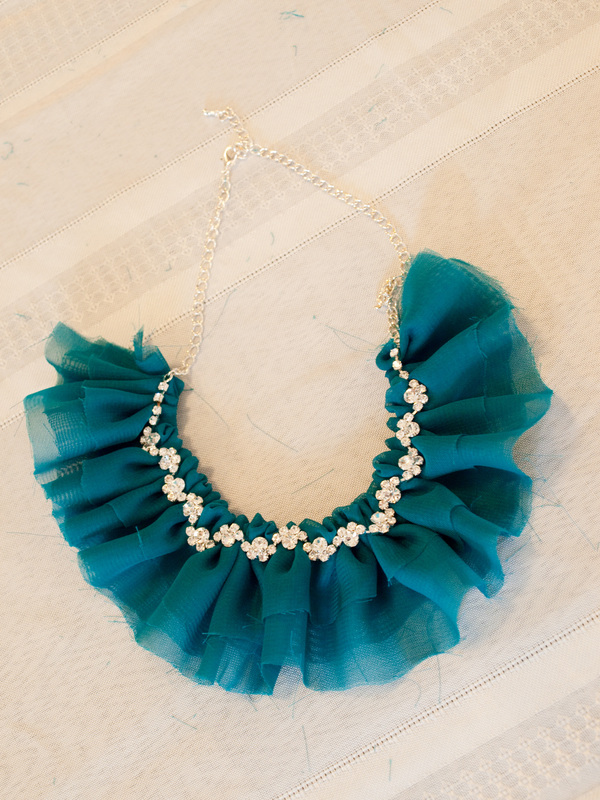 To see the black bib necklace tutorial go here. 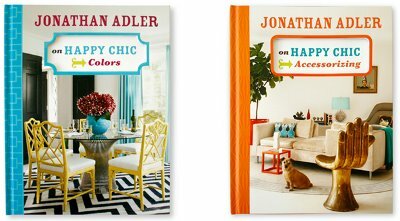 I decided to spruce up my room with a younger, funkier, Jonathan Adler meets Domino Mag (I miss you Domino) vibe and some really happy colors. The problem, like usual, is that I don’t have much of a decorating budget so I had to get creative and try to use what I have as much as possible. I knew the first thing I wanted to do is change the wall color. I decided to keep it neutral and lighten it up so I went with a light gray. This decision was also largely based on the fact that I happen to have a bunch of leftover gray paint from Peyton’s room that I knew I could lighten up and use. 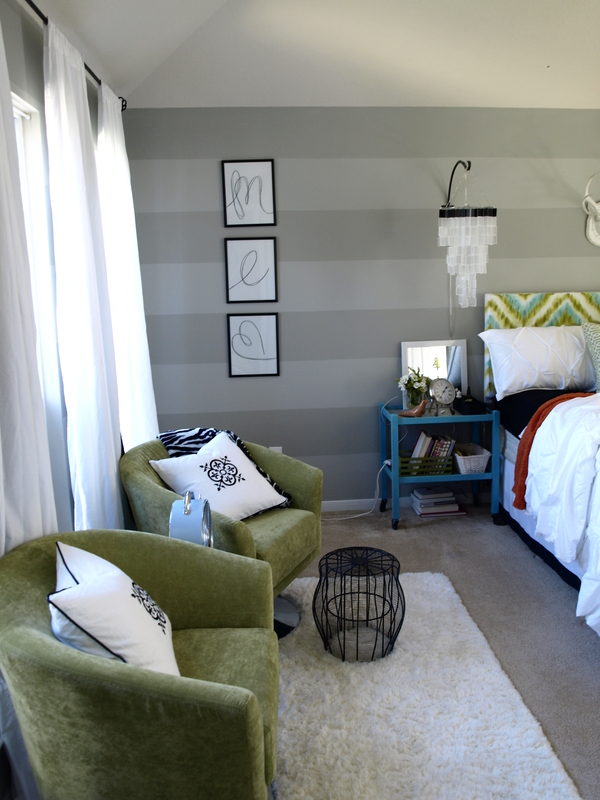 I also knew I really wanted to make the walls come to life so I decided to take it one step further and paint subtle gray horizontal stripes on 3 of the 4 walls. I thought this would be a BIG time consuming job, but it actually wasn’t that bad. 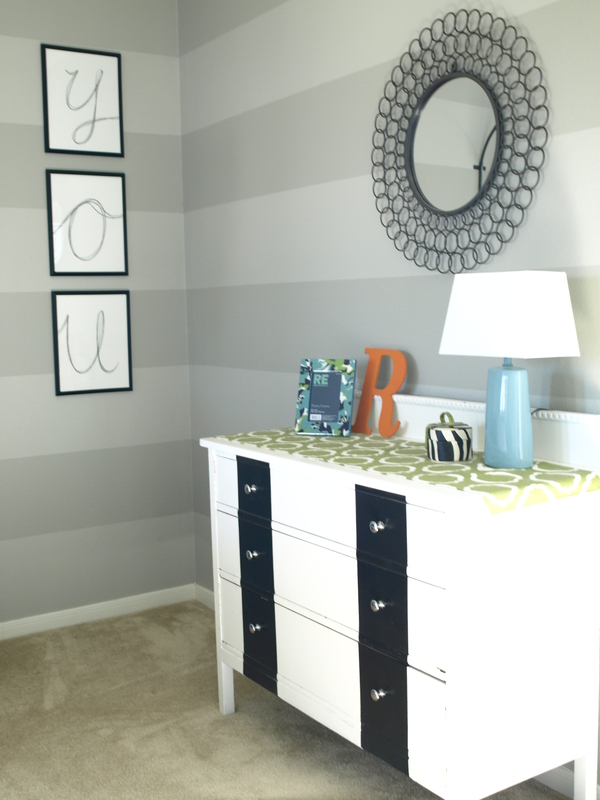 And the lines came out really crisp, even on my textured walls, thanks to this tutorial I found over at Living With Lindsay. I did this all by myself so I imagine it would be much easier with a helper. 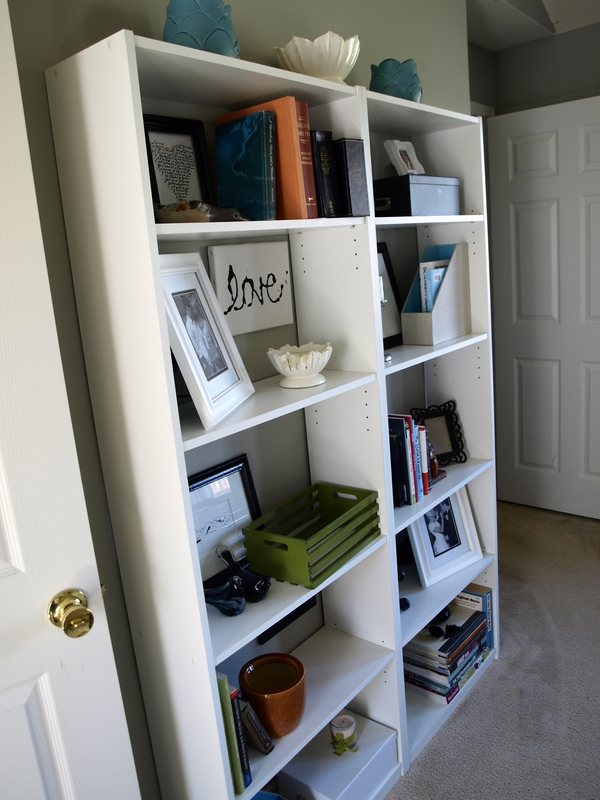 I figure my husband will be less annoyed by my constant redecorating if he doesn’t have to do any of the work, so I do things while hes not looking so he can be amazed at the result later! 😉 Anyway, my stripes are 11.5″ wide. I simply measured from the baseboard up 11.5″, then marked it, and measured up another 11.5″, marked it again, so on…until I had marked off the whole 3 walls, putting marks every 4 feet or so. Then I just layed the tape on the wall as straight as possible from mark to mark. I’m sure its not perfect, but I’m impatient. I think it turned out pretty dang straight actually. 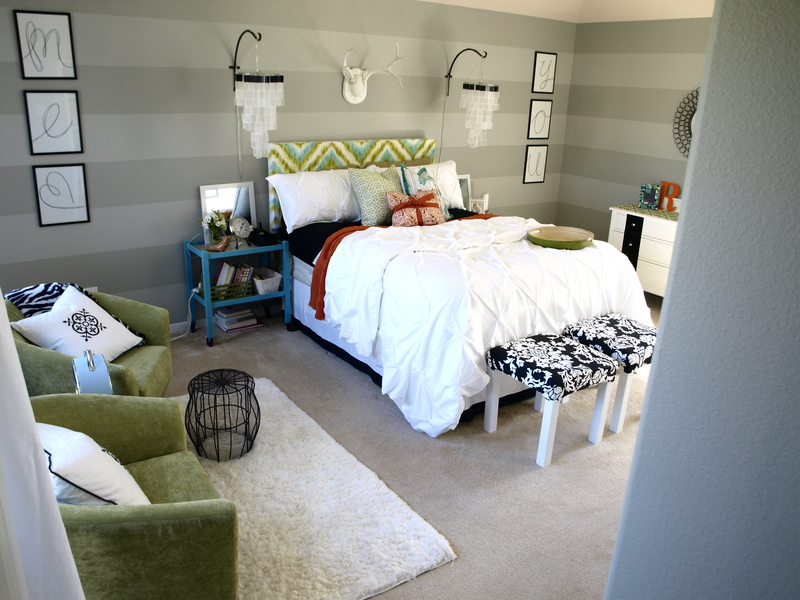 I left the tall wall, opposite my bed, stripeless because A. The weird ceiling line would’ve made the stripes look off at the top, and B. I decided to put bookshelves against that wall that would pretty much cover it anyway. 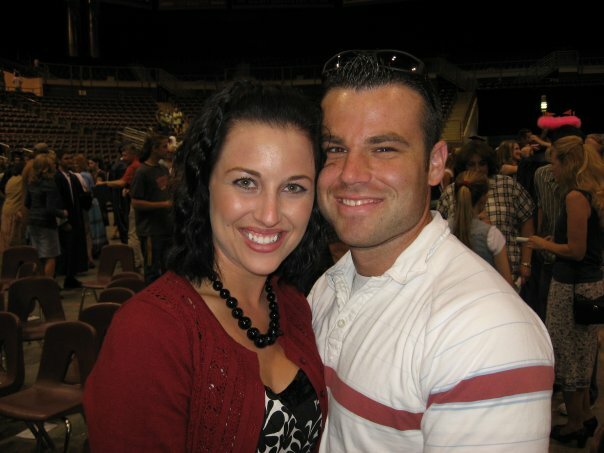 Well, I’ll just show you the pics and walk you through the rest of what I did…. The black frames used in the pic above I got from BigLots for $5 for 2 (I also saw the same ones at Joann’s for $20 for 2 so I got a killer deal). I just wrote on some canvas panels the letters to spell “ME” and “YOU” and flanked the room with them to fill up all the extra wall space surrounding my bed. Okay, I just wanted to talk about these pillows really quick! Little orange guy is just some fabric I have wrapped around a pillow right now but I will soon get to sewing. But the big gorgeous fringed beauty I found the other day at Home Goods in the clearance section for $7. YES $7. 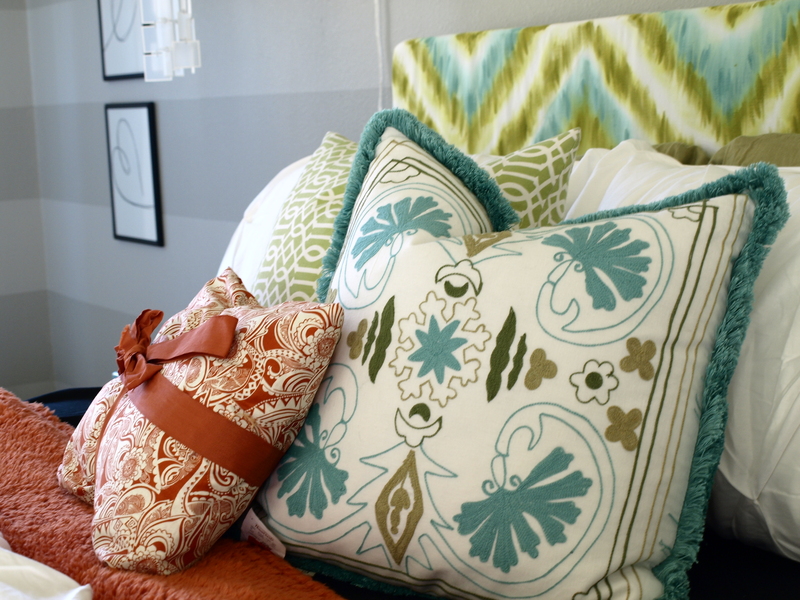 You can’t even buy a down pillow form at the fabric store for $7. I just love it. This is all pretty much the same. I still want to do something more to that dresser. Not sure what though, but it works great the way it is too. 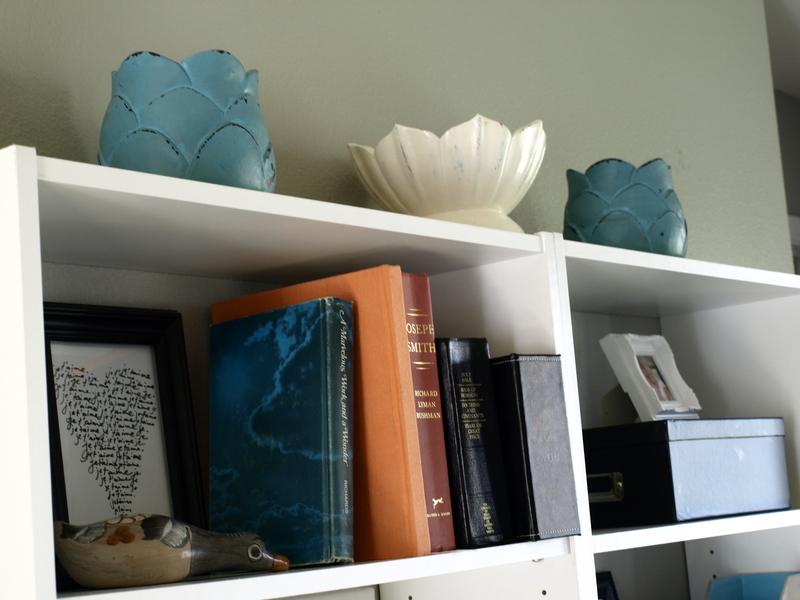 The little teal lamp was on sale at Target for about $20. The picture frame was also a Target buy on clearance for $2 as well as the new duvet cover set that was (my big splurge) about $60. I am also debating on building legs for my shelves to stand on to make them look a bit more custom and give them more height on my tall wall. I dunno. I’ll probably just be too lazy. 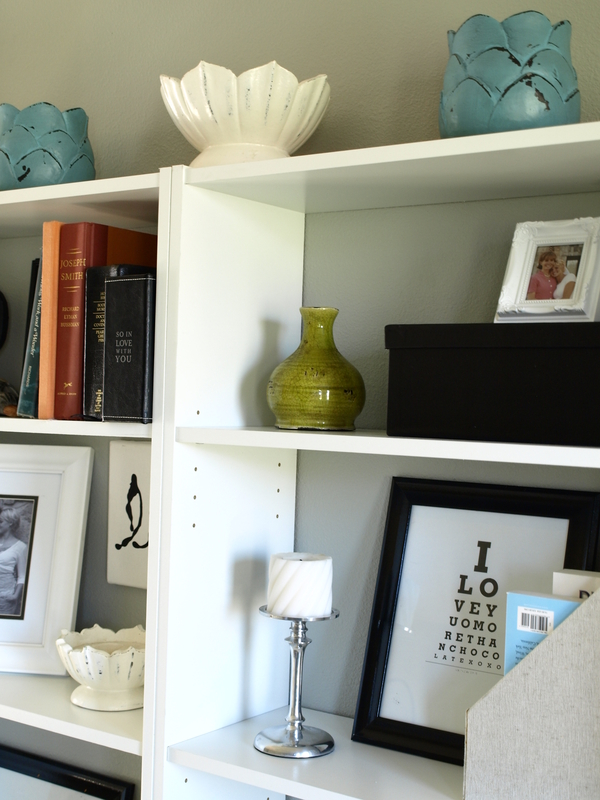 🙂 Most of the accent pieces on the shelves were things I already had although I did pick up a few colorful vases and such at Hobby Lobby (50% off) and Ross. I probably bought about 6 things all under $6 each. And thats pretty much it! 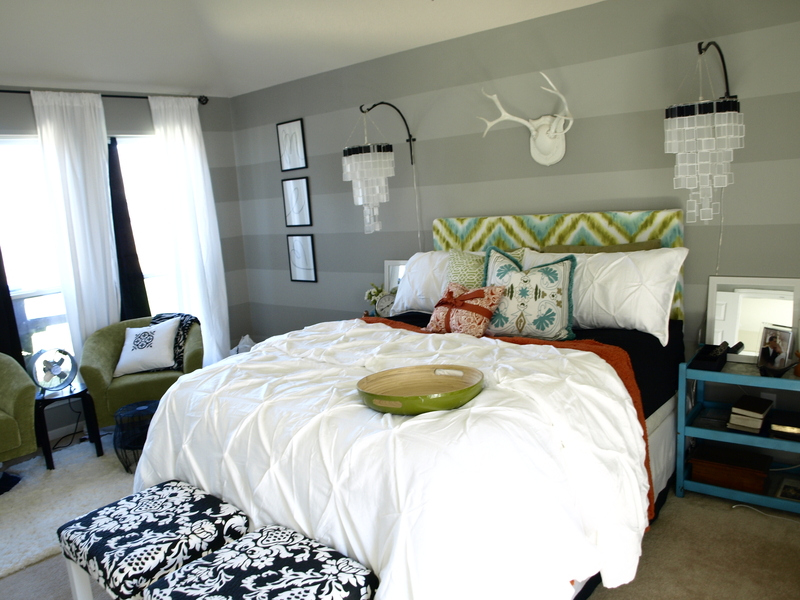 I LOVE my new colorful funky room, and so does the hubby which is always a plus. 😉 I also mixed up some leftover paint from Sawyer’s nursery and am going to be painting my master bathroom shortly in a tealy-blue color. Of course I’ll post it when I get to it!